If a self-driving revolution pans out, autonomy is going to be woven into the fabric of all sorts of transportation needs—personal driving, cargo shipments, long-haul trucking. On Monday, Daimler pitched a concept that aims to encompass multiple uses called the Vision URBANETIC, which it says can be fitted with different modules to suit different needs. Mercedes says the Vision URBANETIC (blame them for the all-caps, not me) is designed to easily switch between operating as a cargo operator for transporting goods or for ferrying up to 12 people around town, in a matter of a few minutes. 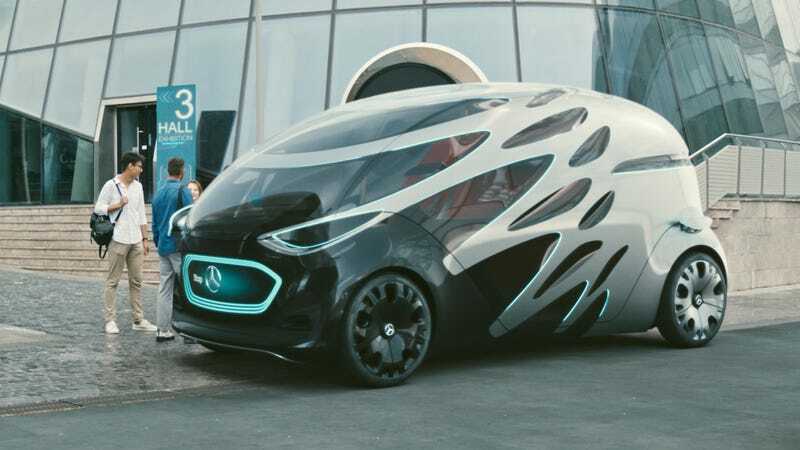 Mercedes characterizes the concept as “groundbreaking,” but automakers and tech companies have been pitching an idea to maximize the use of a single vehicle in recent years, like Rinspeed’s Snap concept or Toyota’s E-Pallete, with the latter hoping to launch by 2020. It’s a simple idea at its core: with an automated system, a vehicle can be in use 365 days a year, around the clock. How much time does your car spend not being driven? Mercedes thinks that means vehicles like the Vision URBANETIC could be used to achieve profitable operation of local public transit systems which can’t be viable by using a driver. Similarly, with a shortage of drivers, it could fill the gap when companies need cargo deliveries to be completed. All this, of course, hinges on autonomous technology being proven to work at scale without human intervention, which we’re no where near to date. But at the very least, Mercedes is presenting an interesting concept, one that makes sense for how autonomy could be utilized in the future—even if it is a tad, uh, jarring to look at first. You excited about the future yet?